"A gem of a new book." "Can I Have a Cell Phone for Hanukkah is a valuable must-buy for all Jewish parents, and not just for Hanukkah. Not only does Estroff give practical childrearing advice but her joyful approach to Judaism is a healthy antidote to religious skeptics." "A warm book full of tangible advice that will fashion children into committed Jews and menschen; In short into people who will be a blessing in their own lives and in the lives of all those whom they meet." "From playdates, homework and extracurricular activities, to bar/bat mitzvah,tzedakah and Jewish holidays, with humor and insight Estroff offers suggestions for coping with the day-today challenges of Jewish parenting...an easy read packed with a lot of good,practical advice." "Sharon Duke Estroff has the uncanny ability to give solid, useful, and practical information on how to raise children while making you laugh out loud at the same time. Her book is a must for every parent Jewish or not Jewish." "How is this possible? Sharon Estroff is younger than I am and has fewer children. Yet Can I Have a Cell Phone for Hanukkah? is brimming with humor and strategy, love and secret parent handshakes. Well, maybe no secret parent handshakes, but there might as well be, as Sharon welcomes us to her private club of parents who adore their children while realizing the children don't actually need online screen-names at five, nor Blackberries at 12." "I'm not Jewish...but I love this book. I laughed through it all while still appreciating the serious lessons it teaches. Every mom and dad with will find themselves nodding and smiling to themselves as they discover each other on every page." As every parent knows, the path one takes when trying to raise menschlich children can be incredibly daunting. Ironically, with all the self-help child-rearing books out there today, the task can seem even more overwhelming. Sharon Duke Estroff has come to the rescue of parents raising children in today's "overachieving, anxiety- filled culture," with her concise, insightful and often hilarious guide Can I have a Cell Phone for Hanukkah? The Essential Scoop on Raising Modern Jewish Kids. The "five zillion-unanswered-questions syndrome" is something of a parental epidemic within the Jewish community and Estroff tackles a wide range of issues that face parents, such as preparing for kindergarten, setting up play dates, safe cyber-travels and cyber-bullying, the "war" on homework and even "Santa envy." As the writer of a now nationally syndicated Jewish parenting advice column and an award-winning Jewish educator, Estroff possesses all the necessary qualifications required to deal with these issues. However, the experiences of motherhood � of no less than four school-aged children � is definitely the principal prerequisite. With wit and insight, Estroff guides parents along the way and advises them to focus on the future and, most importantly, to appreciate the journey. I couldn't help but laugh out loud and nod in agreement at many of the uniquely Jewish situations in which she finds herself. Estroff sets out by comparing the daunting task of child-rearing to building a castle with Lego. "It's like the Lego sets that are stuffed into my boys' closets," she writes. "When you first dump the contents of the package onto the playroom floor, you feel overwhelmed and perplexed; you don't know whether you're trying to build a castle or a spaceship. It's not until you see the picture on the front of the box that all those tiny cubes suddenly take on new meaning as the building blocks of a totally cool medieval fortress. That glimpse at the final goal � while admittedly a bit daunting at first � ultimately gives us the faith, inspiration and direction we need to begin building our Camelot." The raising of a school-age child is no different. One of the most important lessons to be learned from this book is that your "castle" doesn't necessarily have to match the one on the front of the box, as long as your children can view the final product with confidence and pride and use it like a good instruction manual. In most chapters, Estroff introduces the "Jewish parent 911," in which summarizes the topics discussed within the chapter and offers some simple suggestions on how to work through these issues and dilemmas. She also suggests that parents keep the AAA (accept imperfection, avoid the self-esteem parenting trap and accentuate your children's unique sets of gifts) toolbox close at hand while trudging through the parenting jungle. Flexibility and compromise seem to be key elements in Estroff's recommendations on raising children. Comparing parents to palm trees, she suggests that sometimes bending in the direction of the storm can help to instil respect and admiration for others in your children. "If we want our kids to be flexible and accommodate our requests, we must occasionally be flexible and accommodate theirs," she argues..In Can I have a Cell Phone for Hanukkah?, there are constant referrals and links to relevant talmudic laws and Estroff advises us to embrace our Judaism as a parenting ally: "The rich Jewish religion provides you with indispensable backup parenting support in the form of a ready-made curriculum in ethics and morality." Summing her ideas up in one heart-warming reminder, Estroff suggests that we "remember to stop and smell the bubble gum." She's right. Sometimes, we need to just sit back, bless God and enjoy the ride. Can I Have a Cell Phone for Hanukkah? is one of the best parenting books I�ve read this year. As an evangelical Christian, I wouldn�t normally pick up �the essential scoop on raising modern Jewish kids,� but as a mom trying to navigate the ever-changing waters of my nine-year-old�s life in 2007, I have no doubt that parenting this generation requires a working knowledge of their modern culture. Author Sharon Duke Estroff dishes up the scoop with humor and a balanced perspective stemming from her expertise as a mother of four and twenty years of teaching experience. a very informative chapter on �parenting the net generation� with wonderful overviews and safety precautions about IM, social networking, cyber bullying and yes, cell phones. You can download a discussion guide at the author�s site to enhance your study or make a perfect springboard for a book club meeting. If you would like to win one of five copies, leave a comment here, and we�ll announce the winner in next week�s book column. With Can I Have a Cell Phone for Hanukkah? a mother will have help navigating her way through the childrearing years and beyond. With humor and in a contemporary modern mind, the book offers wonderfully creative ways to take your children from one subject to another. Great ideas, great thoughts, and great solutions will take you by the hand. You will excel in family life, in tradition and in your kid�s world. Find easy ways to alleviate the pressures of what kids want. This book belongs in the library of every parent and grandparent. The author, the longtime parenting columnist of the Atlanta Jewish Times and a Marietta resident, offers great explanations of some homemade stories. I especially enjoyed the author�s rendition of drooping pieces of matzah balls along the way until a wild gefilte fish followed and ate all the crumbs leaving the children lost in the woods. Her stories, explanations, and ideas are spectacular! Bravo to Estroff, who has learned how to deal with wishes and pressures. This is very entertaining as well as informative with parental tips, including Internet advice. And by the way, I would also like a cell phone for Hanukkah. I am so excited! (Can you hear my voice shake?) It's time for my second book giveaway. That's right, I have two copies of "Can I Have a Cell Phone for Hanukkah? The Essential Scoop on Raising Modern Jewish Kids" by Sharon Duke Estroff, M.A.T. Now, if you're a Jewish mom, you're probably already skimming through the text here to find out how you can win. But if you're a Christian mom like myself or a mom of any other distinction, read on. Believe me, you'll like this book too. 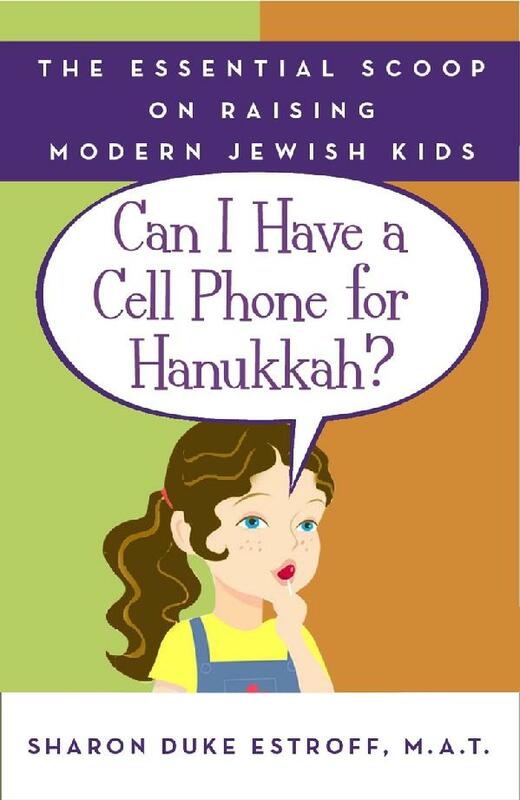 Insightful and humorous, "Can I Have a Cell Phone for Hanukkah?" covers many of the parenting issues us mommy bloggers banter about every day, such as choosing a kindergarten to teaching your children the value of a dollar. Estroff writes in a fun and catchy rhythm that makes her down-to-earth advice a joy to read, including text peppered with Jewish references that add flavor and voice. In fact, I may just start referring to my own son as "my little bubbelah"! Most of this book is totally relatable, no matter what your religion. But if you're a Jewish mom who wants to know, "What do we do about the whole Santa thing?" that's covered too, as well as a section on Bar and Bat Mitzvahs. The bottom line is, if you want to know how to raise your children to be well-rounded, moral people in an ever-more materialistic world, this book will help you along. I'm certainly keeping my copy for a re-read when my son enters the school years! So no, you can't have that one. 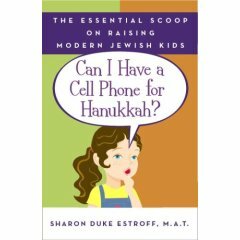 Just in time for the holidays comes Sharon Duke Estroff's new book, "Can I Have a Cell Phone for Hanukkah? : The Essential Scoop on Raising Modern Jewish Kids ." Sharon is an accomplished writer and a syndicated columnist whose Jewish parenting articles have appeared in more than 50 publications. She's also a friend of mine whose children attend the same school that my kids go to. But, don't get the book just because she's my friend. Sharon has filled "Can I have a Cell Phone" with lots of practical advice for Jewish parents, including how to deal with Santa-envy, how to survive the homework struggle, how to plan a birthday party without breaking your budget and how to help shy kids make friends. Also, there are chapters on grade-school playdate protocol and parenting in the Net generation. 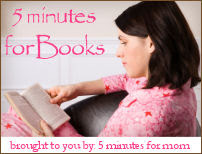 Book Review: What�s a parent to do? Whenever I look at a contemporary parenting book, I find myself sighing and thinking of how much easier life seemed when I was growing up. If we were bored, we were sent outside to play. Organized activities were kept to a minimum and a playdate was when you walked to someone�s house, knocked on the door and asked their mom if they could come out and play. All television shows were suitable for children and home computers, let alone the Internet, existed only as a figment of someone�s imagination. While I hate to sound like an old fogey complaining about how much better the good old days were (especially since I don�t want to go back to them), I still think today�s parents have it tough. At least that was my reaction to reading "Can I Have a Cell Phone for Hanukkah? : The Essential Scoop on Raising Modern Jewish Kids" by Sharon Duke Estroff, M.A.T. (Broadway Books). Estroff, an educational consultant and the author of a parenting column, writes from personal experience: She has four school-age children. Although an award-winning professional educator, she still found herself "paralyzed by the inflated expectations of our overachieving, anxiety-filled culture," that is until she decided to stop racing in the "Mommy 500." Estroff realized the great price everyone in the family pays when parenting is "achievement-oriented." Instead of focusing on their children�s accomplishments, parents should concentrate on raising "resilient, empowered, menschlich, happy children." This is not an easy task, as least according to Estroff. She wrote "Can I Have a Cell Phone for Hanukkah?" "to give [parents] an instruction manual that will help you focus on the big picture while providing clear and specific guidelines to help you achieve it, illuminate the infinite ways that your Jewish heritage can help you make all those little daily decisions that add up to what we call parenting, and serve as a parenting ally throughout the rocky grade-school years." The book covers such topics as choosing the right school, surviving homework, arranging playdates, organizing birthday parties, deciding on extracurricular activities, planning for bar/bat mitzvahs, teaching about money and tzedakah, and dealing with the Internet. Also offered are "Parenting 911" sidebars that discuss sibling squabbles, standardized test scores, making use of time spent in cars and family rituals, among others. Although sometimes the suggestions can be a touch overwhelming (at least to those of us who grew up when parents didn�t have to visit a variety of kindergartens in order to decide which one was the best for their children), Estroff offers excellent advice, especially when it comes to teaching parents to be realistic about what to expect from their children. For example, she notes that although "each and every child has wonderful things to offer," she cautions against offering empty praise, such as telling a child that she has a talent for drawing, singing or athletics when she doesn�t. In addition to helping "children discover and nurture their true strengths," parents need to help them face "up to their limitations." She also discusses the problem with scheduling too many activities, noting how important it is for children to have "downtime" � time when they can learn to amuse themselves � and quotes experts who "believe that downtime can be as, if not more, constructive than all of our children�s extracurricular activities combined." Estroff includes a chapter on dealing with the December dilemma (Christmas) and ways to nourish "children�s Jewish souls." This section also gives practical advice concerning schooldays missed for Jewish holidays and information on how to teach grade-school children about the Holocaust. Suggestions about how to make different holidays more meaningful are offered, although no mention is made of Sukkot and Shavuot. The chapter about planning a bar mitzvah can help families emphasize the mitzvah, rather than the party. Jewish ideas are incorporated into other sections of the book, although the general parenting advice is suitable for all parents. Readers waiting to hear the answer to the title question (should you let your child have a cell phone) may be disappointed, though. There is only one small section in the chapter "Toys, Toys, Toys" that deals with cell phones and which offers suggestions rather than a firm answer. The subtitle of Estroff�s book, "The Essential Scoop on Raising Modern Jewish Children," fits her work far better than the title, which suggests the majority of the book will teach about making consumer decisions. However, that is a minor quibble. Any parent feeling overwhelmed will find "Can I Have a Cell Phone for Hanukkah?" filled with interesting, easy-to-read advice. Estroff has a sense of humor, noting when she�s made parenting mistakes and discussing the lessons she learned the hard way. Parenting in the 21st century may not be easy, but Estroff helps make the task a little less difficult. "Ms. Estroff, mother of four, Jewish educational consultant, and author of a nationally syndicated parenting advice column, writes with wit, candor, and authority. She brings issues and wisdom from her personal parenting experiences, those of the families at her day school, and those from her readers together in gentle, measured, moderate, and reasonable, contemporary guide to raising children." How do you help your child choose between mandatory baseball practice and Hebrew school? How can you plan a birthday party (not to mention bar or bat mitzvah party!) for your child without sacrificing your values, sanity, and pocketbook? How can you keep peace on the homework homefront? And how do you deal with Santa envy�let alone the entire month of December? As any modern Jewish parent knows, balancing family traditions and the realities of contemporary culture can be incredibly challenging. Answering questions both old and new, Jewish and secular, internationally syndicated parenting columnist and award-winning Jewish educator and mother of four, Sharon Duke Estroff illuminates the ways that Jewish tradition can be used to form a lasting, emotional safety net for modern families. Can I Have a Cell Phone for Hanukkah? is an instant classic.